Week 1: Fresh Threat has just hit the wild. Week 2: Half of the world's antiviruses can detect it at this point. Week 3: Some antiviruses may only be detecting it as a threat now and at what cost? Week 4: By now most anti-viruses have caught on but for a lot of users, it may be too late. Hundreds of thousands of malware & viruses are released daily. Even the best anti-virus software available can only detect so much from the time new threats are released up to a day, a week, or even a month after. Universal AV lets you combine more than 10 antivirus engines in one simple software. By catching the malware that your antivirus may missed, this effectively bridges the gaps in between to give you one of the best detection rates from day one to one hundred and beyond. When Universal AV detects threats, it uses data from multiple engines and provides a good indication of what you should consider dangerous, instead of immediately deleting a potentially harmless file. By leveraging the power of the cloud, not only do you get real-time scan results from multiple anti-virus engines at a time, but it uses very little resources and does not slow your computer. You do not have to sacrifice any form of PC protection even though you have more than one security software. 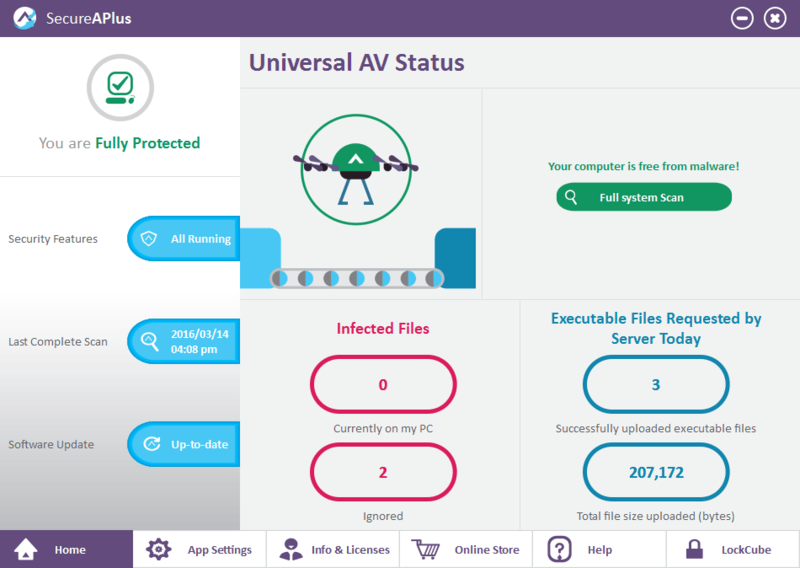 One of the best reasons to have SecureAPlus’ Universal AV is that it complements very well with other security software from anti-viruses and anti-malware, to firewalls, sandboxing and more. Take Universal AV out for a spin with our online demo and see how having multiple engines as your primary or secondary scanner will help improve your virus and malware protection. Will regular full system scans take longer since Universal AV uses 10+ engines? No. In fact, after the first scan to setup your protection, a full system scan is fast as to not disrupt your usual PC usage. Can I scan specific locations such as files & folders over a network with Universal AV? Yes. SecureAPlus has an on-demand scanner that uses Universal AV. Simply right click any file or folder and choose scan. Can I choose to have less than 10+ anti-virus engines scanning at a time? Yes. You may prefer the option to scan with fewer trusted engines by simply disabling the others through the settings. Did We Mention That It's Essentially Free? As a user of SecureAPlus, you get a 1-Year Freemium license. That's 10+ Anti-virus engines from Universal AV & more without spending a single cent.